The Pebble Bay 11.5 is a cat rigged sailing/rowing dinghy 11’-6” in length by 5’-4” in width. Designed to be sailed aggressively, the Pebble Bay is spirited. Yet she can be boarded easily, can handle a bit of weather, rows smoothly & is a comfortable fishing platform. Quite fast under sail, she will often surprise her larger sisters. With her classic shape, & built of select cedars & premium hardwoods, the Pebble Bay is a very pretty boat. Simple construction techniques, a comprehensive builder’s manual & precut components make constructing the Pebble Bay well within the capabilities of the amateur builder. With minimal care this little ship will last a lifetime. An assortment of accessories are available to make your sailing/rowing experience complete. Oars, painters (short lines for handling bow & stern), boat-specific seat cushions & even life jackets have been designed or selected to complement the traditional design of your new sailboat. Includes all construction materials, setup platform & molds, adhesives & fiberglass, jigs, spars, sail & rigging package, reference plan set & builder’s manual. A variety of hardwoods & softwoods can be selected by the builder to make up gunwales, decks, seats & trims. Includes all hardwood & softwood material to build a boat on an existing setup. Here too, a variety of hardwoods & softwoods can be selected by the builder to make up gunwales, decks, seats & trims. Full construction drawing set for the scratch builder with full size patterns for hull molds & parts. Includes diagrams for setup. A boat-specific construction primer with chapters on terminology, the shop environment & all phases of construction including sailmaking, rigging, fiberglass layups & varnishing. Illustrated with sketches & photos. The 16’-8” Sea Opal is a boat for the classic sea kayak enthusiast. Stable, yet remarkably fast & agile, the Sea Opal will handle the solo touring paddler & his or her gear with ease. Traditional lines, optimized length & beam together with timeless cedar strip construction make this boat a true gem. Comfortable seating plus plenty of leg room & cargo space are also distinguishing features of this great boat. Even though the Sea Opal is intended for intermediate paddlers, the novice will find her surprisingly well mannered. Feature strip & deck design elements are tailored to suit each individual builder’s taste. With minimal care this little boat will last a lifetime. An assortment of accessories are available to make your paddling experience complete. Paddles, seat backs, painters (short lines for handling bow & stern), boat-specific seat cushions & even life jackets have been designed or selected to complement the traditional design of your new kayak. Includes all construction materials, setup platform & molds, adhesives & fiberglass, jigs, reference plan set & builder’s manual. A variety of hardwoods & softwoods can be selected by the builder to make up deck designs, trims, cockpit coamings, seats & rails. Includes all hardwood & softwood material to build a boat on an existing setup. Here too, a variety of hardwoods & softwoods can be selected by the builder to make up deck designs, trims, cockpit coamings, seats & rails. A boat-specific construction primer with chapters on terminology, the shop environment & all phases of construction including rudders & controls, fiberglass layups & varnishing. Illustrated with sketches & photos. 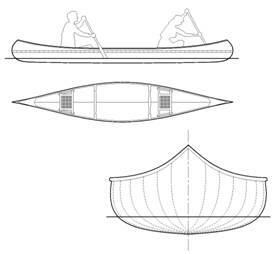 The Necanicum is a two person portage canoe, 16’-3” in length by 2’-11” in width, inspirationally based on the late 19th century lightweight cruising designs of Henry Rushton. Built with select clear Western Red Cedar & premium hardwoods, & designed exclusively for cedar strip construction, this is an extremely attractive traditional canoe. The Necanicum is quite stable, fast through the water, highly maneuverable loaded or unloaded; a paddling delight for day trekking or wilderness packing. 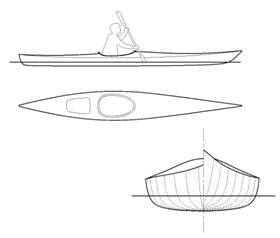 Simple construction techniques, a comprehensive builder’s manual & fine materials make for a canoe you’ll be able to build quickly & easily. An assortment of accessories are available to make your paddling experience complete. Paddles, adjustable seat backs, painters (short lines for handling bow & stern), boat-specific seat cushions & even life jackets have been designed or selected to complement the traditional design of your new canoe. Includes all construction materials, setup platform & molds, adhesives & fiberglass, jigs, reference plan set & builder’s manual. A variety of hardwoods & softwoods can be selected by the builder to make up gunwales, deck plates, seats & thwarts. Includes all hardwood & softwood material to build a boat on an existing setup. Here too, a variety of hardwoods & softwoods can be selected by the builder to make up gunwales, deck plates, seats & thwarts. A boat-specific construction primer with chapters on terminology, the shop environment & all phases of construction including fiberglass layups & varnishing. Illustrated with sketches & photos. Kits: Each of our boats has been designed with the novice builder in mind, & that philosophy extends to the creation of comprehensive, easy to build kits. Plans: For the builder who has the materials, tools & equipment to scratch build, we offer a fully detailed planset. Builder’s Manual: This is a boat-specific guide to construction of the Necanicum. It comes with every kit & covers every phase of construction in detail. The scratch builder also will find it a handy resource & good companion to the planset. Boatwood: If the wood is all you need, here it is. Complete boats: All of our boats can be ordered completely built & finished to order. Call us for info.